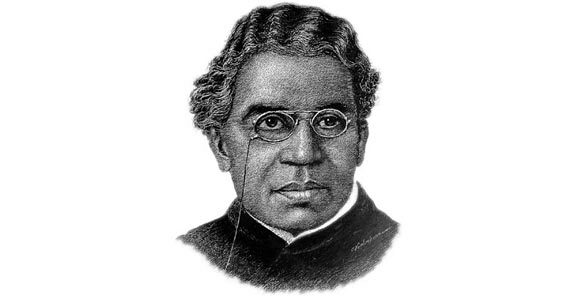 Sir Jagadish Chandra Bose was a prominent Bengali physicist during the British Raj in India. He was born in Bikrampur (now in present day Bangladesh) on November 30, 1858. His father was a magistrate who believed that it was important for him to get a good education in his native language, that is Bengali, before being sent to an English medium school. Thus, Bose obtained his early education entirely in Bengali. He then attended St. Xavier’s School and later college, at Calcutta. His interest in science was developed there under the guardianship of an Indian missionary, Father Eugene Lafont. Bose was awarded his bachelor’s degree from University of Calcutta in 1879. Bose wanted to attempt the Indian Civil Service exams but his father insisted that he should take up a more scholarly pursuit. Thus he went to study medicine at the University of London, England but could not complete his studies because of his ill health. He went on to study Natural Science at Christ’s College, Cambridge, then finish his BSc from the University of London in 1884. At Cambridge, Bose met the renowned Bengali chemist, Prafulla Chandra Roy, who was a student at Edinburgh back then and the two developed a close lifelong friendship. In 1887, he was married to Abala Bose, a well known feminist and social worker. He returned to India in 1885, carrying a recommendation letter from Henry Fawcett, the economist to Lord Ripon, the Viceroy of India. The letter was addressed to Sir Alfred Croft, the Director of Public Instruction in India, recommending that Bose should be appointed as a professor of physics at Presidency College. His salary, however, was half of what Indian professors earned at the time so he refused to accept his salary for three years until the administration gave in and compensated him for his previous salary as well. Another way in which he was discriminated against was burdening him with unnecessary, petty work and lack of proper research facilities and support such as equipment for conducting experiments. Bose often had to buy equipment with his own money and conducted experiments late into the night after he had finished his arduous daily tasks. One of his biggest accomplishments is research into wireless technology and short radio waves. He publicly demonstrated the wireless radio in 1895, in the presence of the Governor of Bengal but the credit for this discovery was largely given to the Italian Guglielmo Marconi, who made a demonstration in 1897. He also invented an improved version of a “coherer” which is a device used to detect radio waves. Despite his own scruples about patenting it, he succumbed to the pressure of his family and friends and submitted his device for a US Patent. This he successfully received on March 29, 1904 for inventing a “detector for electrical disturbances”, making him the first Indian to receive a US Patent. Another important field of research that Bose undertook was the study of plant nervous systems. He successfully demonstrated that plants and animals have similar response to stimuli at the central hall of the Royal Society in London on May 10, 1901. He dipped a plant in a poisonous solution and then showed the movements of its cells on a screen, showing that they vibrated violently and then came to a sudden halt as the plant died due to poisoning. His discovery was extremely significant but initially mocked by many of his colleagues. However, his contributions are now widely acknowledged throughout the world. Bose published various journals and books, and founded the Bose Institute in 1917 for research in various fields such as physics, chemistry and microbiology. He died on November 23, 1937 and received numerous honors including Companion of the Order of the Indian Empire in 1903, Fellow of the Royal Society in 1920 and his work in radio technology being named an IEEE Milestone in Electrical and Computer Engineering in 2012.